Compare prices from several car hire companies in Girona Airport and find the best price for car rental. Our prices always include unlimited mileage and insurance. Girona-Costa Brava Airport (GRO) is located approximately 12 km south of the city of Girona to which it takes approx. 20 minutes to run. The city is located in northeastern Spain and the airport offers several car rental companies. There are bus and taxi to Girona and from here you can take a train to Barcelona. To get to the airport, one can follow the well marked roads N-11, toll road A-7 or C-25. 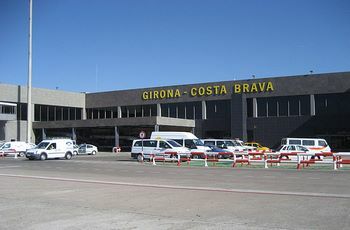 More and more people use Girona-Costa Brava Airport to travel to Barcelona, and in 2008 it was registered about 5.5 million passengers. Budget airline Ryanair and Thomas Cook Airlines Belgium are some of the companies located here. Ryanair offer flights to cities such as Madrid, London, Oslo, Rome and Brussels. The airport boasts restaurants, money exchange offices, hotels and a large tax-free.